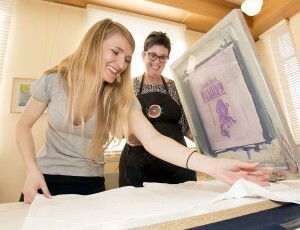 Candace Nicol Garlock, right, and Haley Williams screen print T-shirts during the Building Steam fundraiser on June 25. Williams created the I HEART Sparks Heritage Museum design shown here. The Sparks Museum & Cultural Center held its first fundraiser in the “Building Steam” campaign on June 25. Local artist and museum board member Candace Nicol Garlock screen printed T-shirts with custom steampunk designs created by TMCC graphic communications students, and guests took part part in fun activities to benefit the Sparks Museum Endowment Fund. The fundraiser kicked off a campaign to raise $10,000 by the end of 2016 for the museum’s newly established endowment fund. The principle amount in the fund is invested with the Community Foundation of Western Nevada, and the interest will be distributed to the museum to support its mission preserving Sparks heritage. Donations will continue to benefit the museum for decades to come. During 2016, donations will be matched up to $10,000 thanks to generosity of museum supporter and Sparks resident Charles Steiner. The first 300 donors to give $35 or more to the Sparks Museum Endowment will receive a swag bag with a limited edition print of Engine 8 by Veronica Chapman, a button to show their Sparks Museum pride, and other goodies. Inspired by the From Steam to Steampunk exhibit on display now at the museum, Truckee Meadows Community College students created custom Sparks-inspired Steampunk designs for the screen printing. The Great Basin Costume Society hosted tea dueling during the event. You can donate to the Sparks Museum Endowment Fund online here, or by coming into the Sparks Museum & Cultural Center.